This MDS series has been discontinued. Please see the MDSi8 Series as a possible alternative or contact our Temperature Engineering department. OMEGA’s Model DP41and DP25 meters are available in this attractive, sturdy benchtop case design. All meters can be programmed to display in engineering units of your choice, and come standard with power cord and operator’s manual. This attractive case is 110 H x 260 W x 250 mm D (4.3 H x 10.2 W x 10" D); it weighs 2.3 kg (5 lb). Its light weight is ideally suited for portable benchtop operation. All units operate on 120 Vac for user convenience. 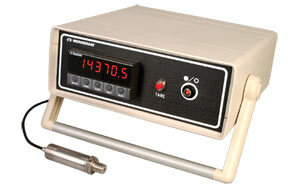 The MDS41 Series contains a powerful microprocessor with adjustable filtering, min/max detection and 6-digit display. The MDS25 is an economical microprocessor with front panel tare and a 4-digit display. Consult OMEGA’s Engineering Department for the Full Selection of Portable Benchtop Displays, Options and Accessories.